We got as far as pre-op today. They even got Greg hooked up to an IV. Then we got some upsetting news from the physician’s assistant. His white blood count is way too high. Then the surgeon came and told us no surgery today. That was hard to hear. Antibiotics now. New labs on Tuesday morning. If the counts come down then surgery will be Wednesday morning. Right now they are way too high. 28000. If they don’t come down, he will be admitted so they can pinpont the cause. The word leukemia was mentioned. I am praying for normal white counts on Tuesday ! Thank you to my readers and friends that are praying with us! We are almost to Greg’s surgery day. We have to be at the hospital at 6:00 am, tomorrow morning. I cannot express my appreciation enough to everyone that has been lifting us up in prayer. We have literally felt them giving us strength. I have been calmer and more peaceful these past two days, than I would have ever thought possible for me. Truly, that is not the norm for me in a situation like this. There is no other explanation for it than the prayers that are carrying me through. For my guild members reading this, thank you, thank you, thank you for Greg’s prayer quilt. It is going to the hospital with us! He was so deeply touched by it. I will get proper thank you’s out after we get all settled back down. I will try to update as soon as I can. Love to all! 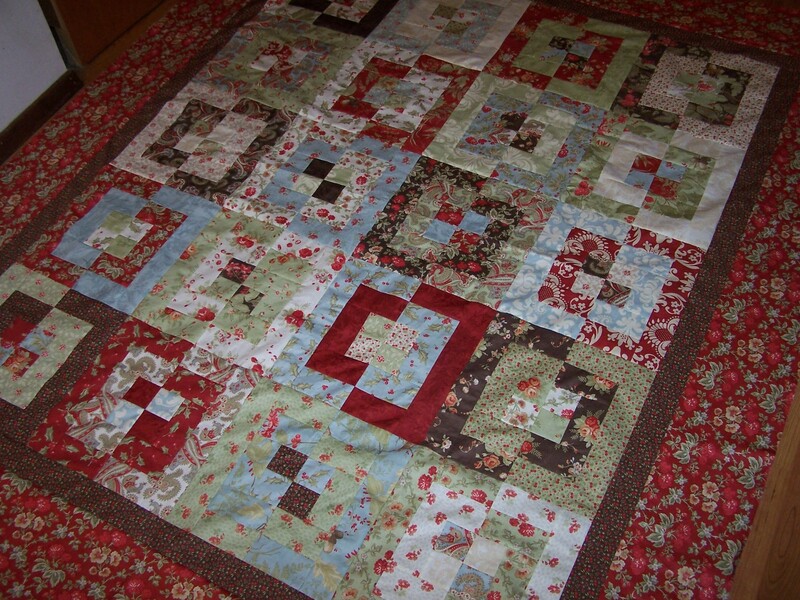 I managed to get my jelly roll quilt top finished this weekend. It is now officially a flimsy! I would love to be able to manage to get the backing made, get it loaded and quilted, and binding made and attached, before Greg’s surgery. That way, I could have some hand stitching to work on. That’s probably being too optimistic, but maybe…. The pattern is All Boxed In by Heather Mulder Peterson. It’s from her book Let the Good Times Roll. The jelly roll was from the Glace fabric line, by Three Sisters for Moda. They are Christmas themed, and I will quilt it with an allover Christmas panto. Yay! I will finally have a Christmas quilt. Surely I will have it finished by Christmas time this year. If you are in need of a good laugh, (which I have been) and another online site to waste time, check out When Parents Text. Be sure and click on the tabs at the top of the page, “archives”, “favorites”, etc. There are lots to go through. I end up laughing so hard I cry at some of them. Enjoy! Literally. Now we have a visual of this unwelcome intruder inside Greg’s head. The surgeon let me snap some quick photos of the MRI with my phone. It is the blob between his eyes, and infiltrating the sinus cavity below. We have our surgery date. On January 28th, this thing is going to get eradicated! The surgeon feels very confident that he is going to be able to get him all fixed up! He may lose his sense of smell, and that’s sad…but, the least of what it could be. We can live with that. So, if you wish to see…. In this next set, I have drawn circles around the whole thing. 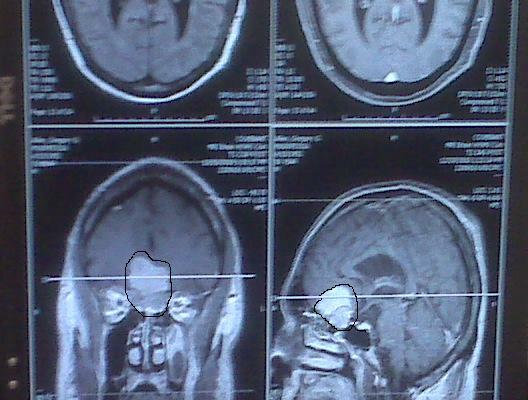 The darker area in the bottom area of the tumor, in each photo, is the sinus cavity, that the tumor has infiltrated. It has grown through the bone to invade that area. The part that is mushrooming up is putting the pressure on the frontal lobes, and causing most of him symptoms. It is causing swelling, especially on that right side where it has grown up farther. The surgeon said he has treated one that had actually grown down the patient’s nostril. At least Greg’s hasn’t gone that far yet! Looking at these photos, I can’t even imagine that. I think I’m feeling a little more peace about it, and Greg seems somewhat relieved this evening, as well. At least we have a plan and a date! Again, thank you all so much for the prayers and well wishes! I can’t express enough how appreciated they are and have been. I know some of you are checking in here just for news about my husband and the brain tumor. We are heading to Lubbock later today. He has appointments tomorrow with the cardiologist and neurosurgeon, and if all goes as planned, we will leave with a surgery date. I want to thank all of you for your comments, your prayers, and all the emotional support. It means more to me than you know. It was so nice to see postings from my local quilting friends! Welcome to my blog! I usually answer all my comments via email, but I just haven’t been able to do that on the last couple of posts. So, I just want you all to know that I appreciate each and every one and it is so nice to read your comments. I won’t lie and say that this is not scaring the bejeebers out of me. It is. I am seeing changes in my husband every day. But, I am optimistically looking forward to a good outcome. The sooner they get this thing out of his head, the better! I will update here after we get back from Lubbock and have a plan in hand. I know there are lots of great guilds out there, but I can’t imagine one any better than ours. The camaraderie, love and sharing among our group is surely something special! I wanted to say something at guild last night, but I knew that I couldn’t get it out without starting to cry. I always leave the meetings inspired, encouraged, enthused, and with just an overall warm and fuzzy feeling. Not to mention overfed! 🙂 I love my guild!